Rediff.com » News » Did Bangalore voters let down BJP? 'Voters did not turn up in large numbers in Bangalore." Till the afternoon of May 15, with leads in 112 to 115 seats, it was believed the Bharatiya Janata Party was going to rule Karnataka. But the party fell short of a majority and the Congress and Janata Dal-Secular, which fought the elections separately, decided to form an alliance and stake a claim to form the government. On Wednesday, May 16, JD-S leader H D Kumaraswamy alleged that the BJP was trying to buy out his MLAs for Rs 100 crore (Rs 1 billion) each. So are we going to see what we witnessed in Tamil Nadu following J Jayalalithaa's death, with MLAs being smuggled into resorts before the floor test? Who will Karnataka's governor call first, the single largest party (the BJP) or the post-poll alliance (the Congress-JD-S)? 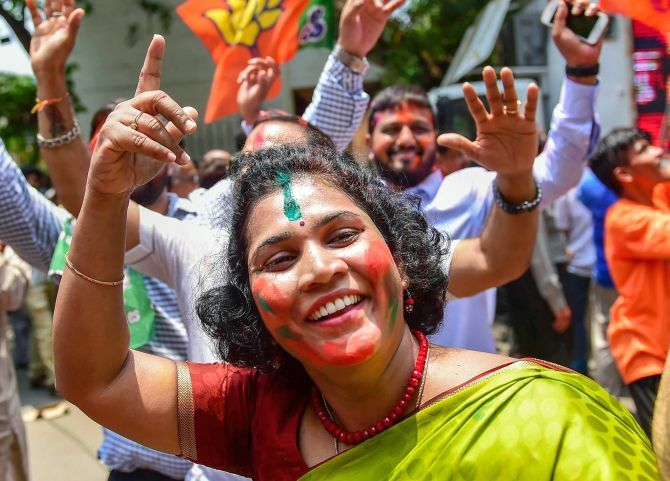 "The Congress game plan is only to keep the BJP out of power," BJP Spokesperson Sudesh Verma tells Rediff.com's Shobha Warrier. Till Tuesday afternoon, it was perceived that the BJP was winning a majority in Karnataka. Ministers Nirmala Sitharman and Ravi Shankar Prasad even distributed laddoos. Was the final results unexpected for the party? We feel this happened because voters did not turn up in large numbers in Bangalore. If more voters of Bangalore had come to vote, we would definitely have reached the magic figure. Still, we are the winners. We are the single largest party. We are only very few seats short of a majority. There is an increase of 64 seats for the BJP (from the 2013 election). What will happen now? Will the governor call BJP leader B S Yeddyurappa to form the government or the Congress and JD-S alliance which has the majority? The mandate is against the Congress. It was not an anti-BJP vote. The Congress won 78 seats which means it has lost 44 seats compared to 2013. So you feel the BJP has won a moral victory to rule Karnataka? Not only moral victory, but we are only a few seats short of a majority. Don't forget, three by-elections are going to take place. You cannot say the mandate is not for the BJP. The difference between the BJP and Congress is huge. So, we feel the Congress should not subvert the mandate and try to paint it as anti-BJP. We were not the ruling party. When the vote is against you, you should sit out. The Congress game plan is only to keep the BJP out of power. If we had done something wrong or the governor had done something wrong, they would have gone to court. Are you saying what the BJP did in Goa was right? What happened in Goa was the Congress was the single largest party, but they did not take the initiative to form the government. Rahul Gandhi did not even talk to the parties that went to meet him. In the meantime, we formed a formidable alliance and staked a claim before the Congress. The governor had only one claim. Just because you are the single largest party does not mean that the governor would call you; you have to stake your claim. Here in Karnataka also, Yeddyurappaji has staked his claim to form the government. When the governor asks him to prove his majority on the floor of the House, where is he going to get the 6 or 7 MLAs from? Are you going to poach them from the other parties? MLAs are not commodities that can be bought in the market. They will act according to their conscience. You should remember that a majority on the floor of the House is important and not the overall majority. If you recall, P V Narasimha Rao ran a government for so many years even when he was short of a majority. There is nothing called a minority government. He ruled because he was not voted out in Parliament. So, on the floor of the assembly, if Yeddyurappaji could prove his majority, he will be able to rule the state. You feel he will be able to prove his majority on the floor of the House? I don't know. If you look at the probability, we have more chances of proving the majority than the other two parties. The Congress fought the JD-S in the elections, but a few hours after the results were out, they joined hands with it to prevent the BJP from coming to power. It cannot be done, as the mandate is against the Congress. The JD-S, while fighting the Congress, said it was the Congress that destroyed Karnataka. Now, are they not joining hands with the same Congress? It is against the mandate. There is speculation that some Lingayat leaders in the Congress are not happy with the alliance and may support Yeddyurappa. Is there any truth in this? I do not know. We are confident that we will be invited by the governor as we are the single largest party and we are only short of a majority by a few seats. We will be able to prove our majority on the floor of the House. Before the election, media reports suggested that there was no anti-incumbency and it was advantage Congress. When did you get the signal that change was happening? I don't agree that there was no anti-incumbency. From day one, we knew we had the advantage because our party president had already travelled several kilometres before the campaign started. He had already done booth level meetings with the karyakarthas. He understood that the mood of the people was for change. But many media people have this anti-BJP bias and they want to see the Congress win. Siddaramaiah created an impression that he delivered good governance. Nobody from the media asked him questions like why did 3,800 farmers commit suicide? Why has Bangalore has come to a standstill? Where have the lakes gone? Why was the rice supplied to poor people so bad? Only we asked. We strongly felt there was anti-incumbency and the people were not happy. In many cases, the state did not utilise the funds given to the state. Do you feel the media did not understand the mood of the people? We have fought many elections and there is a strong feeling among us that in all the elections, they (the media) paint a bad picture of the BJP and a good picture of the Congress and they do it intentionally. There are many people who think the impression created by the media is true. These floating voters matter a lot in closely contested elections where even 1% can make a difference. Which was the turning point, according to you? Was it when Siddaramaiah tried to give religious status to the Lingayats or when Narendra D Modi started campaigning? He tried to divide the Lingayats because they were scared of Yeddyurappaji's popularity. Their game plan did not work at all because Lingayats understood that the Congress was trying to divide Hindus. The truth is people have become more aspirational now because of Narendra D Modi's development-based politics. Now they want better roads and better conditions to live. For that, they look up to the BJP because of what we are doing in the BJP-ruled states. Modiji's schemes like Ujjwala, Mudra, Jan Dhan Yojna, etc have benefited the poor in Karnataka. Yeddyurappa's image is not clean. And the BJP talks about working against corruption. Was it because the party felt he was needed to bring the Lingayat votes that he was projected as chief minister? This is the impression that has been created by the media. When Yeddyurappaji was exonerated by the high court, why did it take two-and-a-half years for the Congress to go to the Supreme Court? Why did they file an appeal just before the elections? If they had filed the appeal earlier, he would have been exonerated before the elections. So is the case with the Reddy brothers. Janardhan Reddy is fighting the cases, and we have nothing do with him. Are they not eligible to contest? If I commit a murder, will you call my brother also a murderer? When these (Reddy) brothers have already contested and there was no case against them, why should we deny them tickets? You can't have two yardsticks for the Congress and the BJP. When Rahul Gandhi and Sonia Gandhi are on a personal bond of Rs 50,000 each in the Rs 5,000 crore National Herald case, they can campaign, but the Reddy brothers can't. Do you feel there are chances of Karnataka going to the polls again? We will have to see. The BJP is in a position to form a stable and formidable government as the people of Karnataka have given the BJP the mandate to rule.